The partners of the space between have published a number of books dealing with organisational work and personal development. Advanced Facilitation by Trevor Bentley and Howard Boorman. Creative Consulting™ – Consulting with a Gestalt focus by Trevor Bentley and Howard Boorman. Most organisational problems are caused by human frailties and an inability of many people to build strong relationships or to work with ambiguity and uncertainty. In this booklet we explore how a Gestalt approach support external or internal consultants and their clients to work much more effectively to support improved relationships and higher performance. Moments of Leadership™ – Leadership with a Gestalt focus by Trevor Bentley and Howard Boorman. The difference between the role of leaders and the act of leadership is described in such a way that it becomes possible to believe that it is within everyone’s grasp to lead. By looking at leadership as a process, rather than a role, the authors show how it is as much the context and circumstances that define leadership as it is the people involved. The opportunity for leadership arises from moment to moment and it is those who recognise and grasp the leadership moment who triumph. "Deserves attention for the way in which it explains how the authors have drawn on their membership of a Gestalt community to develop their own approach." "My copy of this book is covered with my own notes. Clearly I have been provoked and stimulated. I wonder what it would be like if I was to try to set out in 20,000 words precisely what I believed about leadership – perhaps all practitioners should try? Reading this book, pen in hand, would be a good place to start." A Touch of Magic by Trevor Bentley. In the fast changing, complex business world of today, different organisational practices are needed to keep up. This book is about a new way forward. It is about the magic of contact, complexity, creativity and chaos, and how leaders and consultants can tap into these things to create magic of their own. Conundrum 101 by Howard Boorman. A crime novel drawing on Howard's training as a psychotherapist. Jason Phillips, a psychologist at NSW University, faces a dangerous conundrum. If he alibis a small time drug dealer accused of a series of brutal double murders, he will risk his career and make himself the target of corrupt police. Even more disturbingly, he risks bringing himself and his family and friends to the attention of the real killer. Creativity by Trevor Bentley. Innovation and creativity are two of the most important business skills. Organisations are looking for significant growth, not just marginal improvements, and need innovative ideas and creative approaches at every stage. This book shows you how to get your team to explore problems from different angles and to foster a creative environment. Facilitation by Trevor Bentley. Being a facilitator means helping groups and individuals work together in continually different situations. Chapter by chapter, this book follows a real-life workshop facilitated by Trevor and Howard, from the workshop’s inception to completion. In this way you're provided with living examples and illustrations of the high and low points of facilitation in practice. “. . . within five minutes I was having trouble putting the book down! What makes it different to other ‘how to’ management books is the author’s innovative approach to facilitation and the unusual way the book has been compiled. 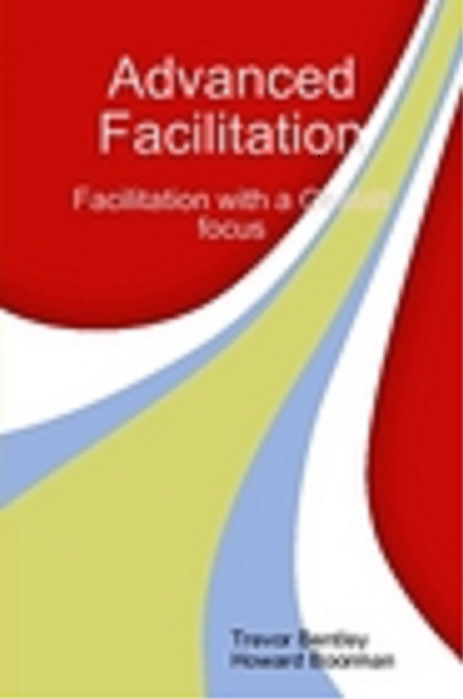 This book would appeal most to more experienced trainers and facilitators as it challenges modern day custom and practice of facilitation and group training. It might also interest readers seeking a greater understanding of interpersonal and group dynamics." Gestalt: a philosophy for change a booklet by Sue Clayton and Trevor Bentley, bringing together a series of six articles published in Training Officer. Parsifal Stories by Trevor Bentley. Executive coaching as an art form combines a lifetime of experience, an understanding of psychology and wisdom. In this book you can see how a coaching master, the wizard Parsifal from Arthurian legend, works with this art form. Often it seems there's a touch of magic as Parsifal works with the CEO and executive team, King Arthur and his courtiers. Simply People by Sue Clayton (now Sue Congram). This book is a treasury of insights and wisdom about relating to others in life, love and work. With an easy to read format and delightful graphics, Sue invites you to discover the art of co-creating quality contact and desirable outcomes with the people you encounter in all walks of life. A practical ‘how to’ book with a series of exercises for new and established teams. This book is designed to help teams discover new dimensions and their fullest potential. Advanced Facilitation, Creative Consulting and Moments of Leadership and are published through Lulu.com and can be obtained as hard copies or e-books directly from the Lulu website: www.lulu.com. Conundrum 101 can also be purchased as through www.lulu.com (hard copy only). Alternatively you can order hard copies through us for AUD$20 (plus postage and GST if applicable). Gestalt: a philosophy for change retails for AUD$15 (plus GST if applicable). All other books published by the space between retail in Australia for $44 (including GST) and can be supplied by mail for the cost of postage. All books supplied outside of Australia retail for $40 plus the cost of postage. Discounts apply for multiple copies. If you would like to place an order for any books published by the space between please go to: Book order. We'll contact you via email to arrange postage and invoicing. Howard has also contributed to the book Culture Shock! Philippines co-written by his wife, Grace Roces Boorman (with Alfredo Roces). This book is a “survival guide” for anyone living, working or travelling in the Philippines. It offers insights into the Filipino ways and culture. It’s especially useful for business travellers and expats, and includes business etiquette and advice on housing, the school system, banking and employing local staff. If you would like a copy of any of these books and cannot find them through your local bookseller or on-line, please contact Howard via howard@thespacebetween.com.au and we will endeavour to obtain a copy for you.